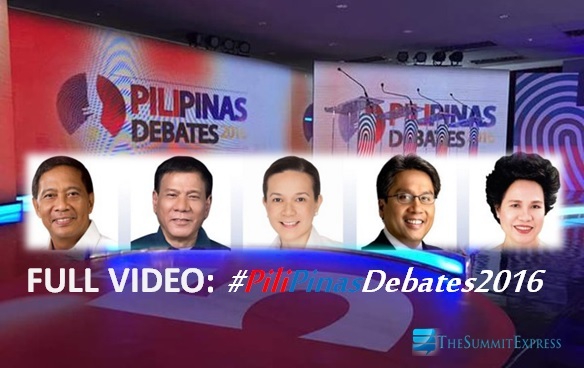 MANILA, Philippines - The second leg of presidential debate dubbed as 'PiliPinas Debates 2016' was held on Sunday, March 20, at the University of the Philippines (UP) in Cebu City. The full video replay of this historic but controversial event is now available online. The Commission on Elections (COMELEC) in partnership with broadcast giant TV5 and print and online media Philippine Star have successfully mounted the debate after more than hour-long delay in the start of the program due to issues on debate rules. Four presidential candidates attended the event. Vice President Jejomar Binay of United Nationalist Alliance (UNA), DILG secretary Manuel Roxas II of Liberal Party (LP); Independent candidate Senator Grace Poe; and Davao Mayor Rodrigo Duterte of PDP-Laban squared off to discuss platforms and their views on disaster preparedness, climate change, health care, women's rights, education and fighting corruption. Meanwhile, Miriam Defensor Santiago did not attend as she needs to undego clinical trial. Who do you think dominated the second #PiliPinasDebates2016? Express your thoughts in the comment section below.